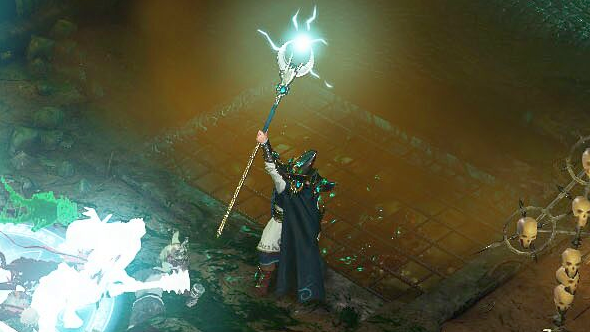 Announced a couple of weeks ago, Warhammer: Chaosbane is the latest project to make use of Games Workshop’s determination to leverage its mighty IPs in fantasy (and sci-fi) videogames. 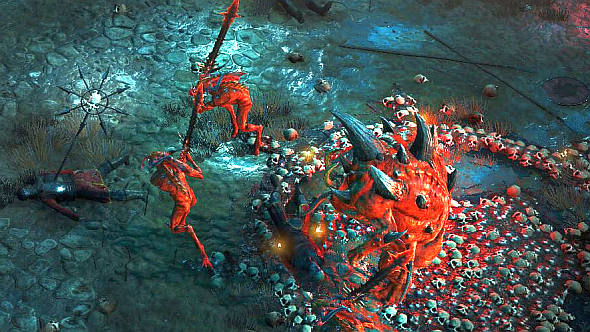 It’s interesting for a couple of reasons: first, for being a Diablo-esque action-RPG (much like Warhammer 40,000: Inquisitor – Martyr), and secondly, for adapting the original Warhammer Fantasy universe. It’s now been several years since Games Workshop – famously evangelical with their IP – blew up that universe and replaced it with Warhammer: Age of Sigmar. Apparently, ol’ Gee Dubs are still happy to see videogames based on the old property. Get your fill of hacking, slashing, and role-playing in the best RPGs on PC. So, why not Age of Sigmar? What will make Chaosbane special? And just why are dwarfs so much better in every way than elves? Ahead of E3, we spoke with Jean-Georges Levieux, game director at developer Eko Software, about all these topics and more. Well, maybe not the dwarfs thing, though it’s true and you know it. It’s the beards. PCGamesN: Games Workshop killed off Warhammer Fantasy and replaced it with Age of Sigmar.Why did Eko want to make a game from the older IP? Jean-Georges Levieux: The Warhammer Fantasy setting is one of the most iconic in the wargaming, pen and paper, and videogame mediums. It’s an IP that isn’t afraid to tackle mature themes and combines humor with tragedy in a very interesting way. Naturally, the IP also showcases an impressive cast of races, deities, and antagonists, making for an extensive pantheon of Chaos abominations for players to fight. Add to this a deep and detailed lore spanning decades, and you pretty much have the right ingredients to make an action-packed, story-driven action-RPG that appeals to both Warhammer fans and players looking for a fresh take on the genre. Did GW have any misgivings about licensing another Warhammer Fantasy game? Levieux:From the beginning we felt that the teams at Games Workshop were pretty excited about the idea of having a Warhammer Fantasy action-RPG. Additionally, we believe that we have a good grasp of the genre and we are very passionate about Warhammer Fantasy, which is something that definitely helped in licensing the IP. If you come by during lunch break, you can be sure that we will all be playing the tabletop game. Can you give an overview of the storyline? Levieux:For the moment, we don’t want to spoil too much of the story, and we’ll make a specific focus on that a bit later. All we can say is that we are working hard to offer players a story that will be up to the standards of the IP. Since this is one of our main ambitions for the title, we teamed up with one of the most well-regarded Warhammer Fantasy writers in order to build the story and characters. We can’t wait to show you more! You say it will be set “in the middle of Old World history.” That means it’s not End Times, right? Levieux:Your assumption is correct: the game is set within the Warhammer Fantasy IP canon, not the End Times. The first screens show a High Elf Mage and an Empire Captain. Can you give an overview of the Wood Elf and Dwarf characters, and their playstyles? Levieux:Each character has their own playstyle and gameplay mechanics in the game. You will see that, if you play the game with friends, it’s even more interesting because everybody can have a different role. The Empire Captain is a tank, able to take a lot of damage and specialised in close combat. The High Elf Mage is less resistant but is capable a dealing a great amount of damage from afar. As for the Dwarf and Wood Elf… we’ll introduce them later on. This already looks like a great opportunity for co-op play – can you confirm online or local co-op yet? Levieux:Yes, the game will have both online and local co-op, for up to four players. Would Diablo comparisons be fair? Levieux:We understand the comparison and we are very happy if our game reminds people of Diablo. Blizzard did a great job on that IP – it’s one of the most popular in the videogame universe. 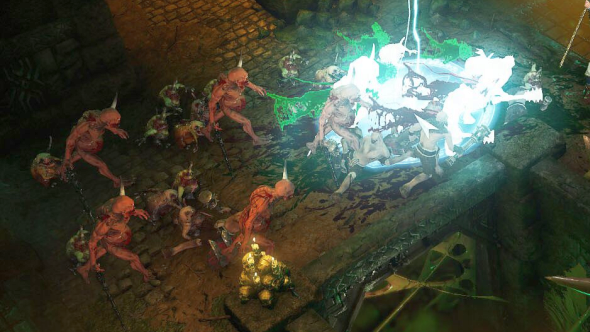 But we haven’t revealed the full scope of Chaosbane yet and what makes it stand on its own. Rest assured, our main goal is to provide players with a great game and this remains our biggest priority. Naturally, when developing the game, we looked at what the main games in the genre focused on and what players enjoyed about them. 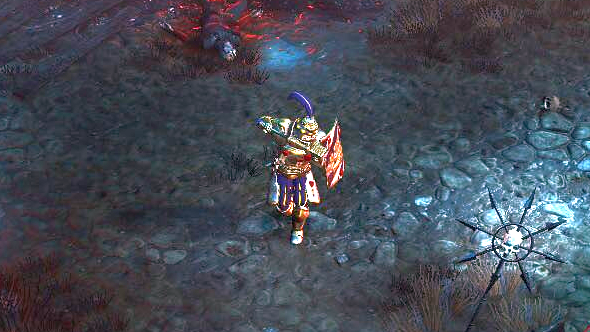 Diablo was among the games we covered, but we also looked at titles like Torchlight II, Grim Dawn, and Path of Exile. This research helped us choose what direction Chaosbane would be headed in, and we can confirm that it does not approach the genre in the same way as Diablo has done. So what will distinguish Chaosbane other than the Warhammer setting? How is Eko innovating in the genre? Levieux:There are two main aspects that make Chaosbane’s approach to the action-RPG feel fresh when looking at the genre as a whole. First of all, we are emphasising gameplay variety, meaning characters are not only differentiated by skills and attributes but by gameplay mechanics as well. We believe the game’s greatest strengths are the gameplay systems that were implemented to differentiate each avatar not only through stats, skills and gear, but through gameplay as well. Secondly, the game has a strong emphasis on story and characters that we’re hoping will help appeal to players who are not familiar with the Warhammer Fantasy setting. PCGN: Any word on a release window yet? Levieux:The game will release in 2019. We will announce an exact date later.